Giddyup! 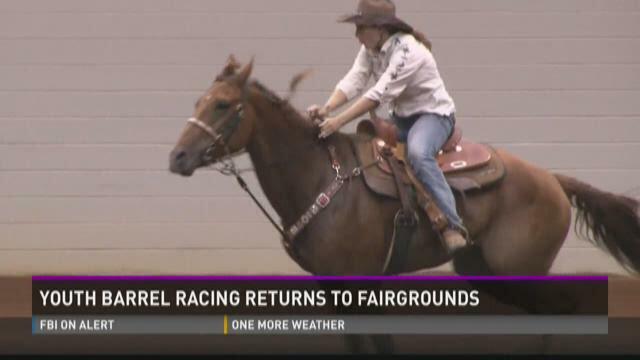 Barrel racing is back at the Georgia National Fairgrounds. "It's a big family sport," says Mike Dameron, the event coordinator. "And I'm going to tell you something about barrel racing, because barrel racing is growing bigger, bigger, bigger all the time." Thursday, kids got a chance to compete against the clock to earn a piece of the roughly $175,000 that will be given out this weekend. "The adrenaline rush and just getting together with your horse," says Charidy Williams of Jackson. "It's a different language." A Peach County man was arrested in woods behind his home after a family dispute. Sheriff Terry Deese says a deputy tackled Joshua Kargelis, age 20, around noon and took him under arrest. That happened about 90 minutes after his mother reported that Kargelis had barricaded himself in his room, with a gun, and threatened suicide. Earlier, Deese said, he had been "destroying the house." Deese said Kargelis struck his mother, causing bruises on her arms. No one else was injured. When officers arrived, he was actually in the woods nearby. Officers surrounded the area and then tackled him. Kargelis is charged with battery, possession of a firearm by a convicted felon and possession of methamphetamine. Deese said he had a .25-caliber semi-automatic pistol, but not shots were fired. The New Perry Hotel is under new ownership, and the contents of the 19th century restaurant and hotel are being liquidated to make room for renovations. Hunter Joyce stopped by today to see what kind of discoveries shoppers might find. "We're selling everything," says Jillinda Falen, co-owner of estate sale company Sweet Southern Home. "You stand still too long, we'll stick a price sticker on you." Before the new New Perry Hotel can open, its current contents must be sold. Houston County Sheriff deputies responded to a domestic call with shots fired Thursday around 5:45 p.m. in Perry at 214 Culpepper Road. According to a news release, 43-year-old James Barton pointed a rifle at deputies while they tried to talk to him, but he told deputies to "go away" while locking himself in the house. Deborah Bennett, Barton's sister according to the release, told deputies earlier that he threatened to kill her and fired one round from a pistol into the floor of the house they share. Barton surrendered to deputies after a brief standoff. He's at the Houston County Medical Center and is facing charges of aggravated assault, terroristic threats and reckless conduct. Anyone with information concerning this case should call the sheriff's office at 478-542-2080 or 478-542-2085. Perry animal shelter workers say there is a dire need for a new building. After a work session on Monday night, they might be a step closer. City leaders now have a better idea of how much that might cost, which they say will direct how they move forward. "It's just not conducive to adoption, and it's hard to get volunteers in an environment like that," says Davis Cosey. He is the founder of Friends of the Perry Animal Shelter and member of a task force Mayor Jimmy Faircloth assembled last year. "It's been over a year of meetings to come up with something we could put on paper and present to council," Cosey says, and that is finally what they did. Next Friday, June 26th, you can buy your own piece of history at The New Perry Hotel. The hotel, which is over 100 years old, is closed for renovation, but will open up a liquidation sale. The hotel closed its doors on New Year's Day this year and new owners took over in late January. According to a news release, the owners plan to renovate and refurnish the hotel and restaurant. The sale will include, but are not limited to: artwork, mirrors, mini fridges, microwaves, head boards, bed frames, glassware, lamps, tables, chairs, rugs and books. Owners of the property will be donating proceeds from the sale to two local organizations, Friends of Perry Animal Shelter, and the Perry Area Historical Society. The staff at Perry's animal shelter says they are concerned about the well-being of the animals because of conditions that keep getting worse. A task force goes before city council Monday to pitch a budget estimate to build a new shelter. Cathy Shaw walks through the kennels, greeting her "babies." She has been a loyal volunteer at the Perry Animal Shelter for the last two years, but she's one of few. "Nobody wants to come down here and volunteer," she shrugs, and says it is because of how run-down it is. Dogs are in outdoor kennels all year. "We have one fan that's supposed to cool the dogs all summer long," Shaw says. "Whenever it rains, the water comes down the hill out there and floods the kennel."